Working an internship in college is about as essential as tailgating the homecoming football game, attending your first frat party, or your first experience in a lecture hall filled with hundreds of people. However, being a graduate from a fairly smaller city school these are 3 instances I have very limited experience in. But what I lack in knowledge of the traditional college experience, I make up for in working internships. By the time I graduated, I had worked 8 internships, not to mention the internship I worked for a month after obtaining my Bachelor’s degree. While I look back on most of these internships very fondly, there’s always been one obstacle standing in the way of me recommending the internship experience: lack of pay. As a struggling college student, money is not something you take for granted. You convince yourself you can make a week’s worth of groceries last for 3 weeks, quiver at the mere thought of opening your bank account, and will attend any event with free in the name. So why does someone with such little money work so many unpaid internships? They’re a necessity. In the age of Millennials, you simply can’t get a job without experience, but you can’t get experience without a job. 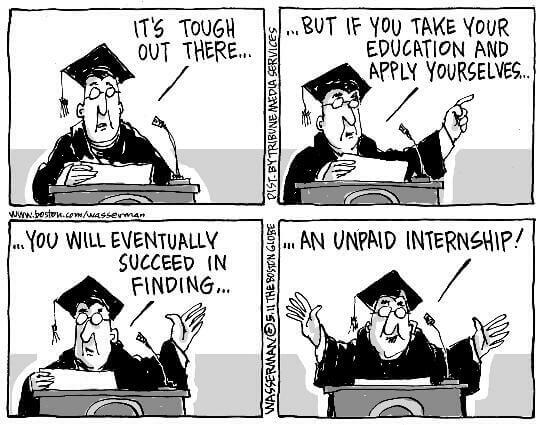 That’s where the age of internships comes into play. Although internships are nothing new, the amount of students taking on 1 or more has grown exponentially. A 2010 article from The New York Times reports that, “In 2008, the National Association of Colleges and Employers found that 50 percent of graduating students had held internships, up from the 17 percent shown in a 1992 study by Northwestern University. “ Surely, the number is even higher now. While paid (or even, for credit) internships are certainly a worthwhile experience, the unpaid internship is an institution that is not only illegal, but also immoral. Although some internships strictly require coffee runs and menial errands, many unpaid internships ask for real work that real employees are paid to do. Both are equally as frustrating. Interns who get coffee and run errands are wasting their time trying to get an experience in the industry they want to break into following graduation. How do you learn about the industry when you spend all your time ordering your boss a Venti no-whip triple shot skim Mocha at Starbucks? On the other hand, in the internship experience in which you actually get to contribute, why are you doing the work of a salaried employee for free?